Here’s a new one for you. What did a calenderer do? Any ideas? We hadn’t, so off down the proverbial rabbit hole we disappeared to find out more. 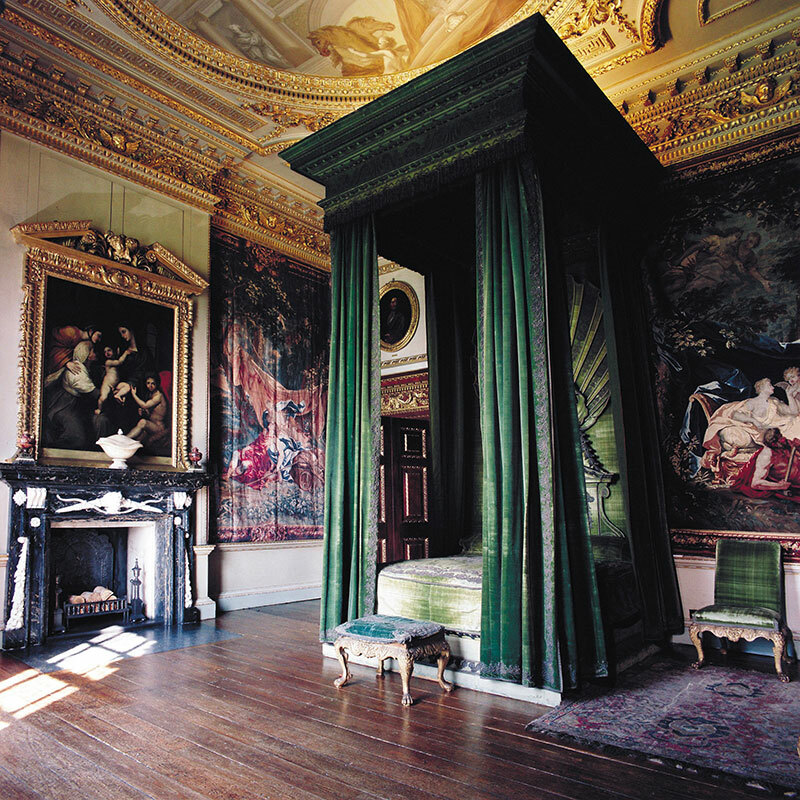 When you’ve visited a stately home and wandered into the bedrooms with those immense four-poster beds, like this one at Houghton Hall, have you ever wondered how on earth they cleaned the drapes around the bed – or is that just us (rhetorical)? We have looked at beds and bedding in a previous article, so we thought this subject required further investigation. Looking at the sheer amount of fabric they must have been incredibly heavy, can you imagine trying to climb up there, take them down and wash them by hand? We have visions of several servants attempting to do this precariously balancing on ladders. But no, if you were wealthy you would employ a calenderer to do part of this process for you at around 12-15 shillings per bed which equates to roughly the wages to employ a tradesperson for 5 days in 1790. Calenderers, also known as calico glazers (the term appears to be interchangeable), would visit the home and were often described as ‘journeymen’ (we should point out at this stage that our research has shown that quite a few women also carried out this type of work), unstitch the drapes, from the bed frame, take down the canopies and bedding. The fabric would be washed by the domestic servants, then the calenderman (person) as they were often termed, would apply the final process and rehang the fabric. It was a process that would have been carried out for the most affluent in society. We noted that Dido Elizabeth Belle had her mahogany bed at Kenwood House, ‘washed and glazed’ for 12 shillings. Glazed or shiny chintz originally known as calico, was the favoured style of the eighteenth-century for bed drapes and curtains. The fabric would be scoured and washed, then stretched. The material would be starched with a special solution and finally, the glaze, similar to a waxy substance would be applied using a machine with heated rollers, known as a calender to give it a lovely sheen. The Garrick Bed, ca.1775. A four-poster bed designed by Thomas Chippendale with 20th-century reproduction hangings. Courtesy of the Victoria and Albert Museum. It would have been a very time-consuming job to unpick the curtains and drapes, carry out the process, then restitch everything back into place. Despite this, it was a relatively cheap job to do, around 12 shillings. This was because although labour intensive, labour was cheap at that time. London had relatively few calenderers, unlike Manchester which seems to have had plenty, but there were quite a few calico glazers. The job of calico glazer required a seven-year apprenticeship to be undertaken, so a skilled trade. Quite a few of these companies went bankrupt as we’ve found them appearing in the newspaper lists, so it doesn’t look to have been the most lucrative of occupations. Clout. Calenderer and Calico-Glazer. No, 10 King Street, Golden Square, facing the chapel begs leave to inform his friends and the Ladies in general, of Chintz, Muslins, Dimities, Cotton and Linen Gowns and Dresses, in the most elegant manner, without taking to pieces, on the following terms. N.B Wanted an apprentice or any young man, that would wish to learn the above business; none need apply who cannot command a small premium. Silk dyer, Calenderer and Glazer to Her Royal Highness the Princess of Wales. We came across several newspaper advertisements by women, including the family firm of Wrights, which included the three daughters of Mrs Wright, the owner, who took over the business upon the death of their mother. We have looked for wills for all the calenderers that we’ve found and not one, so this leads us to conclude that in all likelihood they didn’t have enough to make it worthwhile leaving one. The shiny paper used for women’s magazines and suchlike is ‘calendered’ paper. Obviously a modern take on the same basic process. It’s produced by putting it through pressured rollers. I had no idea…thank you! You learn something new every day here. Awesome! Oh wow, how interesting. We did notice that there appeared to be far more calenderers in Lancashire than anywhere else in the country.